Dalit leader and MLA Jignesh Mevani later tweeted that trustees of HK Arts college cancelled the event because of threat calls made by BJP goons. 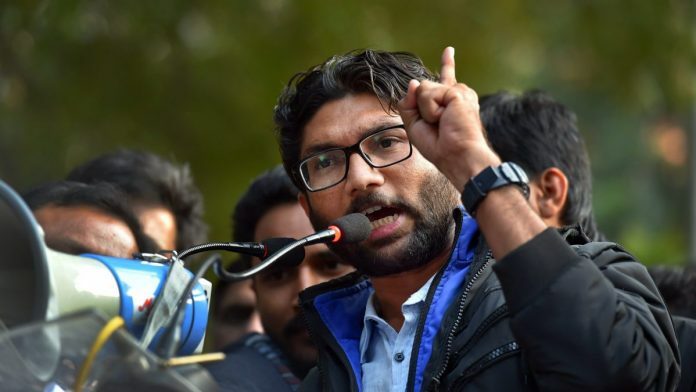 Ahmedabad: A local college cancelled its annual day function Monday, after its trustees got protest calls against Dalit leader and Independent MLA Jignesh Mevani being made the chief guest. Slamming the decision of the Brahamchari Vadi Trust, which runs the HK Arts College, principal Hemant Shah resigned from his post, claiming the trust “compromised on the freedom of expression” and gave in to threats by student leaders of a political party. Mevani is an alumnus of the college. The trustees denied access to the auditorium, located on the campus, due to which the event had to be cancelled. “Because of threat calls made by BJP goons, trustees of HK Arts college, Ahmedabad I graduated from cancelled the annual function where I was invited as chief guest. Was going to talk about life and mission of Babasaheb (Ambedkar). Salute to Principal Hemant Shah who resigned on moral ground,” Mevani tweeted. Mevani accused the trustees, some of them Padma awardees, of “not standing up against the hooliganism” of BJP and its student wing, the ABVP. “This is a shameful day for freedom of speech and democracy,” he added. “Since Narendra Modi became the prime minister, many people have become spineless,” he said. This college trustees fall in that category, unfortunately, he added. Trust secretary Amrish Shah could not be reached for comments despite repeated attempts. In his resignation letter, Principal Shah said the trustees had given in to threats issued by student leaders belonging to a political party. The trustees had compromised on the freedom of expression, he added. Shah said his decision to invite Mevani was not wrong as leaders from different political parties have been invited to earlier events in the college. “It is clear that freedom of thought and expression given in our Constitution are being stifled in the current political scenario, and this is being patronised politically,” Shah said. Some student leaders had threatened to disrupt the event if Mevani was invited, he said. “The trustees decided not to offer the hall for the event after getting scared from the threats issued by these student leaders. I do not think that inviting Mevani was a wrong decision,” he said. “Humans will not be humans without the freedom of expression and will be reduced to becoming a pawn in the hands of a demonic system called government,” he said. Expressing his strong dislike for the decision of the trustees, Shah said they “gave up on their freedom in the face of political pressure, which is shameful”.